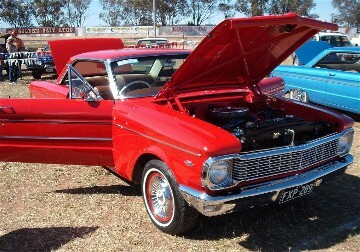 The XP was the "make or break" Falcon: Ford's future in Australia depended on this car succeeding. Ford's Deputy Managing Director Bill Bourke conceived a promotion for the new model which was a major gamble: demonstrate the XP's strength by mercilessly driving a fleet of XP Falcons around its You-Yangs testing grounds for 70,000 miles (110,000 km) at over 70 mph. 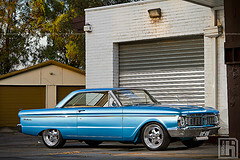 "Short Left - Long Right"
The gamble paid off with the Falcon winning the prestigious Wheels magazine Car of the Year award. 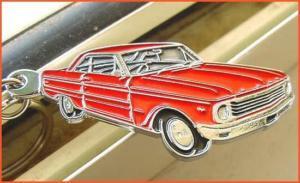 A 3-speed automatic progressively replaced the 2-speed and front disc brakes were introduced as an option (standard on Fairmont and Hardtop models). The XP was built from March 1965 until August 1966. Additionally in the XP range several cars were modified by Bill Warner to install a 260ci/289ci V8 and a three speed automatic or four speed manuals. 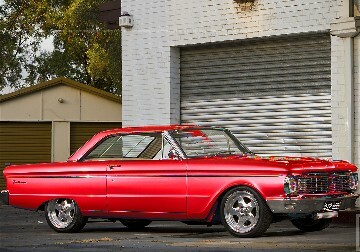 These cars are discussed as a precursor to the GT Falcon which debuted in the next model or as XP Falcon Sprint's. "Short Left - Long Right"